by PANDA BEAR Tomboy proves, above all else, that Panda Bear has risen to the challenge and surpassed (as well as sidestepped) all expectations. Underground and experimental in his approach to sound, he also strives to craft gorgeous pop for the widest audience possible. With Tomboy, he’s attained his greatest balance between the two extremes yet. by PANDA BEAR Tomboy b/w Slow Motion is the first in a series of limited edition seven inch singles by Animal Collective’s Panda Bear: a taster for the much anticipated release of the Tomboy full length, coming on Mistletone in the Australian autumn. We have a very few copies of the Tomboy b/w Slow Motion 7″s remaining of this super limited release. 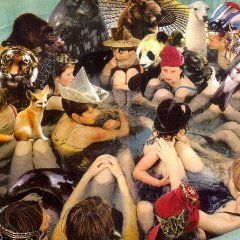 PANDA BEAR 7″ $15.00 + FREE POSTAGE WITHIN AUSTRALIA!